Incorporated on August 15, 1887, it was one of the first self-governing all-black municipalities in the United States. The population was 2,159 at the 2010 census. 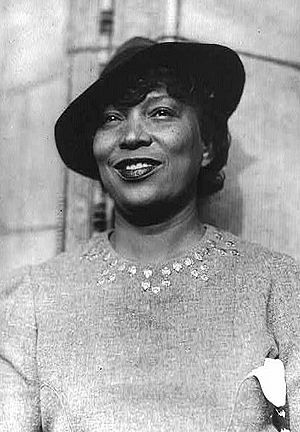 Noted author Zora Neale Hurston grew up in Eatonville, which she featured in many stories. 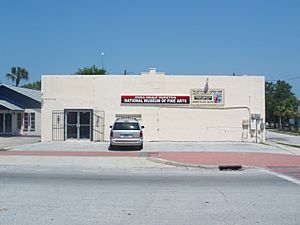 In 1990 the town founded the Zora Neale Hurston Museum of Fine Arts. Every winter the town stages the Zora Neale Hurston Festival of the Arts and Humanities. A library named for her opened in January 2004. Eatonville is also the hometown of David "Deacon" Jones, a professional football player. While sources seem to disagree on the exact date and year of the town's incorporation, the town's official site provides a detailed account of the process and the dates. According to that official source, the town is named after Josiah C. Eaton, one of a small group of white landowners who were willing to sell sufficient land to African Americans to incorporate as a black town. Hurston's novel Their Eyes Were Watching God presents an overview of the founding of the town through the eyes of Janie Crawford, the protagonist. It is considered a roman à clef. The novel refers to several Florida locales known only to insiders. Eatonville is located at (28.618727, -81.383440). In the town, the population was spread out with 33.6% under the age of 18, 8.8% from 18 to 24, 27.5% from 25 to 44, 19.6% from 45 to 64, and 10.4% who were 65 years of age or older. The median age was 31 years. For every 100 females there were 88.7 males. For every 100 females age 18 and over, there were 81.3 males. "Eatonville" is a song by indy rockers The Samples, written by Andy Sheldon. The song was written after Sheldon read Their Eyes Were Watching God. It appears on their fourth album, The Last Drag, released in 1993. 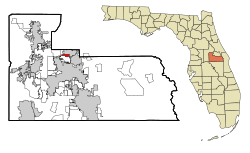 Eatonville, Florida Facts for Kids. Kiddle Encyclopedia.